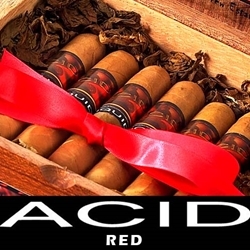 The Acid Red cigars offers a bolder and spicier smoking experience to each and every user who loves a rich and full cigar. These hand-rolled premium cigars are produced individually by expert Torcedos at Drew Estate in Nicaragua. Every Acid premium cigar is bound with a US Connecticut Shade wrapper and infused with long filler Nicaraguan tobaccos cured in aroma rooms, where they acquire the right essences of herbs, oils, and botanicals.